Just under a month ago, word got out that Wonder Woman 1984 scribe Dave Callahan had been hired to work on a mystery script for Marvel Studios. Today, word is now out that the project he’s writing for is based on Shang-Chi, Master of Kung-Fu, which stars a Chinese superhero. Deadline has confirmed that Callahan (who is Chinese-American) has been hired to write the script to involving Marvel’s first Asian cinematic superhero in a leading role. Their sources have also indicated to them that Marvel are specifically looking for a director of Asian descent, potentially being the second hire after The Eternals director Chloe Zhao. The film will reportedly have a predominantly Asian cast, similar to Black Panther‘s cast being composed almost entirely of African-American, African-European, and African actors. In the comics, Shang-Chi is an expert martial-artist who was trained in seclusion under the belief that his father was a humanitarian. However, when he was released into the real world to do his father’s bidding, he discovers that the man is actually a criminal mastermind and that he’s meant to be his enforcer. Shang-Chi ultimately rebels and uses his powers to directly challenge his father’s dark legacy. While the move to develop this movie may be seen as an apology for the alleged whitewashing of the Iron Fist property on Netflix, Shang-Chi predates that IP by a few months. In reality, Iron Fist was created to be a white superhero as a way for Marvel to capitalize on kung-fu movies made by western martial artists like Chuck Norris, while Shang-Chi was one of Marvel’s first Asian protagonists in the comics, made slightly earlier to capitalize on the popularity of actors like Bruce Lee. Marvel are said to want to modernize the character in a way that avoids bringing up unintentionally-problematic elements of the character’s original background. For instance, Shang-Chi is the son of the criminal mastermind Fu Manchu in the comics. Aside from the fact that the rights to the Fu Manchu franchise (which predate Marvel by several decades) are a mess to begin with, they’re also associated with really racist implications left by the “Yellow Peril” era of fiction, so it seems like Marvel will find a different character to fill the role. Perhaps Marvel could use this opportunity to substitute Fu Machu for the Mandarin; not the impostor, but the real one teased at the end of the Marvel One-Shot All Hail the King. This would have a pay-off for a lingering plot element that “fixed” an unpopular story idea seen in Iron Man 3 (that made the Mandarin, Iron Man’s archnemesis, just a drugged-up actor staging a role). While the character of the Mandarin has also been associated with “Yellow Peril” criticisms, perhaps having him face off against an Asian superhero instead of a white superhero would sidestep those kind of problems. 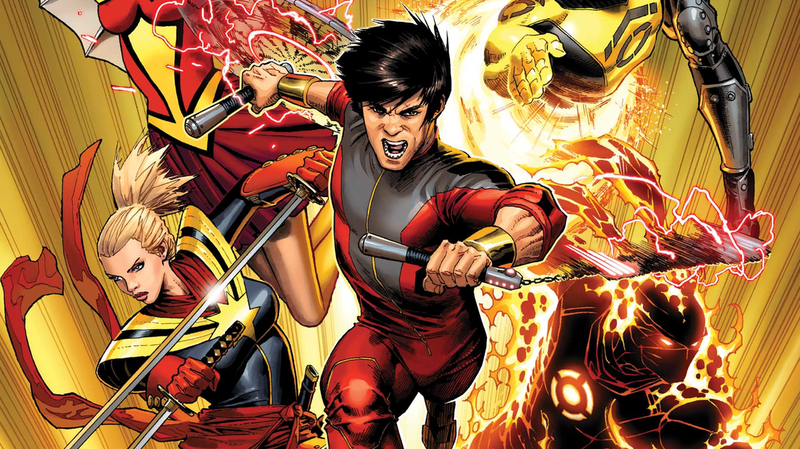 The untitled Shang-Chi movie project is in development at Marvel Studios.